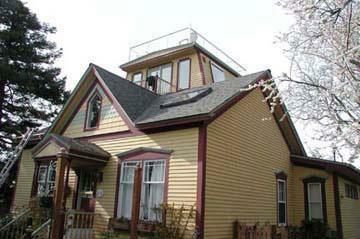 We purchased an older home in Port Townsend in 2008, and as part of the transaction the sellers replaced the roof. 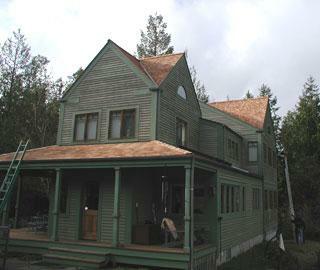 Our home is a bungalow which had been expanded upward sometime in the past, so that the roof-lines are very complex. We interviewed two roofers and selected All Weather Roofing to do the work. The owner, Loren May, impressed us with his knowledge and his commitment to quality. The work he did was in fact exemplary. The roof is in great shape and it looks beautiful. They cleaned up the yard and the garden and you would never know the roof had been replaced. We would happily recommend Loren for any roofing work. Loren and his team from All Weather Roofing delivered as promised, with enthusiasm and confidence. From the beginning, Loren returned all phone calls in a timely and efficient manner, and stayed true to his word every step of the way. We were especially impressed at the way this group works with each other, and the friendly respect they always had for us. And our roof looks spectacular! We would recommend All Weather Roofing without any reservation, and have already been doing so. 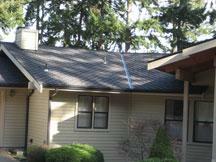 Recently All Weather Roofing was contracted to replace a Cedar shake roof on our home. It was a sizeable job involving some 50 squares of roofing material literally done in the middle of winter. As an owner having a leaky roof, which also resulted in damage within our home, was extremely stressful. My principle objectives were to have the work done quickly, with the highest quality and for a fair price. All Weather Roofing exceeded my expectations! You and your crew arrived promptly on Monday morning and went to town removing the old roof and preparing the roof understructure for the new roof material. At the end of the day the job site was cleaned up! Wow that is not something you see too often. Within the first hour it was obvious that the All Weather Roofing crew was seasoned, experienced and carefully went about their work. Care was taken not to cause any collateral damage to my home and property. That too was refreshing! The job was finished on Friday, ahead of schedule and as they say the proof is in the pudding. My home looks terrific and my initial objectives have been met beyond my expectations! I would be happy to recommend All Weather Roofing as a high quality Roofing contractor. I wish to express my thanks and appreciation to you and your crew for a job well done! "My roof started leaking suddenly for no apparent reason. After waiting for a couple of other roofers to show up to look at the roof, I finally found All Weather Roofing and called and talked to Loren. He promptly came out and looked at the situation and provided me with an estimate for the work. He had other jobs but because my roof was leaking he managed to move things around so that he could get to my job quickly. His crew showed up, worked long and hard and finished in just a few days - including installing new skylights. They were all very professional and courteous. I would definitely recommend them for any roofing needs."